1993 Edition: 1500 • Image size: ?? x ?? Years ago, as Labor Day drew near, columns of wood smoke from thousands of curing barns would appear in the southern skies as the new crop of tobacco was harvested and dried for the auction block. The farmers would sleep in sheds next to the barns in order to tend the fires and maintain an even heat around the clock. When Dempsey Essick first heard about Hubie Stafford, a Guilford County, North Carolina farmer who still cures tobacco in the old way, he knew that.it might be his only chance to capture a scene that has almost disappeared from the rural landscape. Hubie is perhaps the last of the breed. He is over eighty years old and still clings to the tried and true methods of farming he learned as a boy. In "Hubie's Place," Dempsey has captured the feel of a September morning near the end of the harvest season. Hubie's handmade quilts, being aired in the soft sunshine, add a touch of color to a picture dominated by the rusty brown of the barn roof and the weathered, hand hewn logs of the building itself. 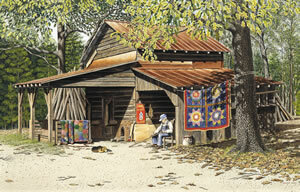 Dempsey has pictured Hubie at his favorite curing-time diversion, sitting in front of the shed where he spent the night, whittling on a tobacco stick, while his old dog relaxes nearby. An early drop of leaves from the oak tree marks the last tranquil days of summer and the approach of autumn which is just over the horizon. When I saw Hubie's barn for the fist time it was like a trip back to the days when I was growing up on the farm. I remembered getting up at daylight during the week, pulling tobacco and loading sleds all day then jumping in the pond to wash off the tobacco gum. We would spend the week loading the barn then sit up all night to tend fires on Saturday. We made the weekend into a combination family get-together, camp-out and picnic. There was always plenty of country cooking and marshmallows to toast, and sometimes we'd cut a watermelon fresh out of the field. That was just part of the memories that went through my head when I first stood in from of "Hubie's Place". Meeting Hubie himself was a delightful experience. His is one of that old breed of farmers who is more comfortable outside; more at home on a tractor than in an air conditioned car. Hubie is over eighty years old. He as a wonderful sense of humor and a zest for life that would do credit to a person half his age. He has worn out more overhalls than I have socks and when I went out to spend the day with him, working in the field, he wore me out. The experience served to remind me why I decided years ago not to be a tobacco farmer. I was lucky to grow up in the country amoung the hard working, honest farm folks who are the salt of the earth. 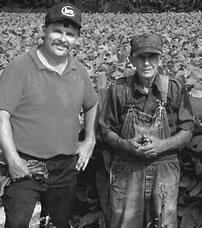 That's why "Hubie's Place" is important to me, because I consider it to be my tribute not just to tobacco farmers but to farmers of all kinds, everywhere.